Spud the dog and Bubble the cat, settle down for the night. There is no such thing as an empty box with a cats in the house. Storm Doris has raged around us today, I think we’ve escaped lightly, the barn doors broke free of their bolt, but thankfully the doors and hinges survived without damage. The lane is currently blocked by a fallen tree, but I suspect that Derbyshire County Council have far more urgent cases than our tiny lane, and we can take an alternative route, I’m very glad not to have been traveling today, it was a bumpy ride for many. I wrote this post last Thursday, the 23rd of February, shortly before our telephone and Internet connection disappeared. It’s now the first of March and I’d really like them back now. Our mobile data is disappearing fast. Technorati Tags: Storm Doris,Plusnet,rural broadband. Categories: Cats, Dogs, Travel, Weather | Permalink. Love the photo. Looking forward to your next blog so hope they get you reconnected soon. The delights of rural living! The photo looks very familiar – Doug has assumed a similar position on many occasions. You have Internet via phone line and try to tell us you live in the wilds of Derbyshire!!! In our part of the Stour Valley our internet speed is barely a dribble via a fixed line so we have an EE 4G mobile connection at 40mgb!! We don’t have Internet by land line because we live in the wilds of Derbyshire! Joe has to 100 plus meg at university. He may never come home! I wish you a rapid re-connection as I know that the inconvenience of no internet far outweighs the much lauded benefits of freedom from the pressures of our technological era. We do have internet by landline but it is still painfully slow. I share your pain. Cute photo! Hope you get everything restored and back to normal soon. I have a friend in Ecuador who used to shove her USB modem through a metal colander to make a connection. Sometimes it worked; sometimes it didn’t. There have been days when ours has gone down that I’ve wondered whether I could do the same — it is frustrating! I do hope all is well in your cyber-world by now. 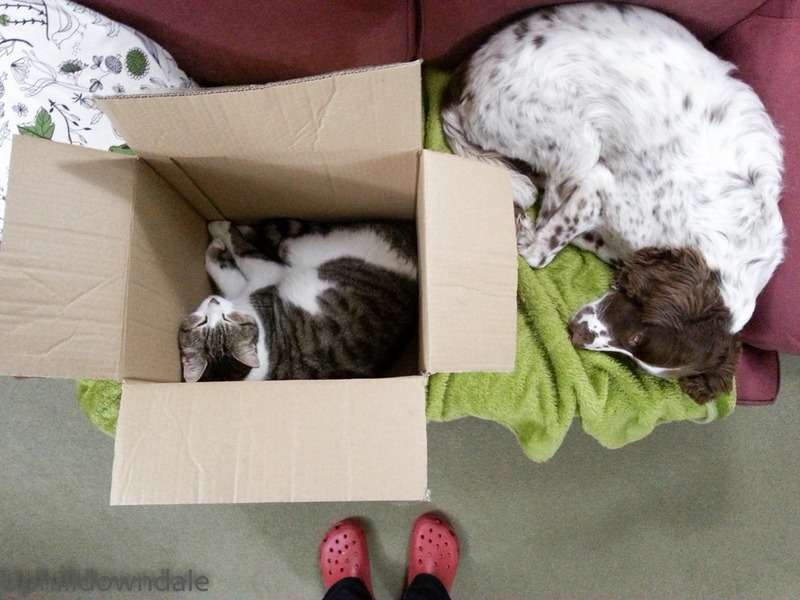 As for your cat in the box– isn’t that just the truth? My Dixie Rose does the same thing with every box that comes in the house. She may only do it once, but every box has to be checked out for curlability! I first noticed the box was snoring! We may have to get the colander out! Its going to be a long haul.